Integrate your eDirectory with our ArcaMailer platform and you can be capturing email addresses in seconds, organizing lists and engaging your market as frequently as needed. With our awesome Arca Mailer platform, you can seamlessly integrate your eDirectory with our email sending platform. 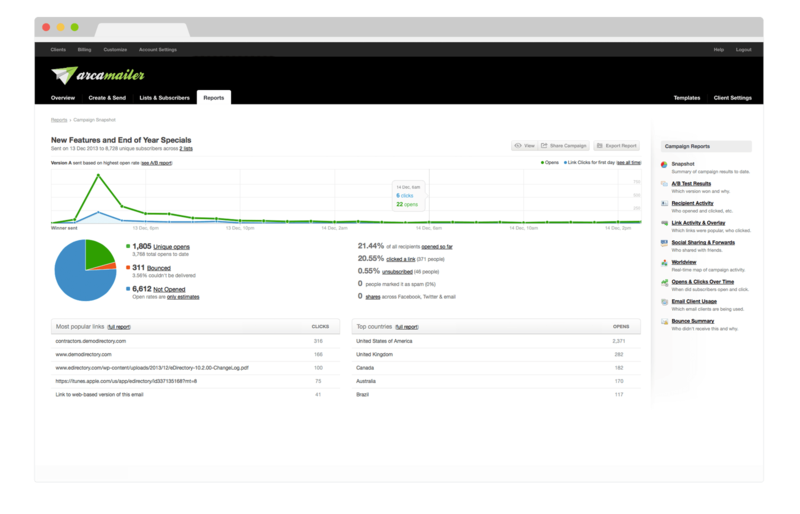 Create subscription lists, view delivery in real-time, and deep metrics coupled with a beautiful interface (not to mention beautiful emails), it's a winning combination. Choose from a selection of gorgeous email themes as soon as you sign up. Straight away your emails will look gorgeous; users are going to want to read your content. Track your campaigns in real time as they are opened across the globe and view it all on our interactive map: see who opens what, where they click, and how your campaign is received amongst your user base - total transparency. Emails that render poorly on mobile devices is a thing of the past. All of our included templates render perfectly on all mobile devices, desktops, and cell phones. Whether your list has a hundred or millions, Arca Mailer can handle the load. eDirectory’s newsletter delivery partner has years of experience and handles email for a number of Fortune 500 companies. Use advanced features such as A/B testing subject lines and message bodies to optimize your messages to achieve higher open rates. Opt-out functionality is built-in, saving you time and hassle of managing your email list. Additionally, the list management functionality will ensure your list is up-to-date and only contains valid addresses.